With a location right in the heart of Kansas City, Windstar Lines proudly provides charter bus rentals to the Lawrence community. Halfway between Topeka and Kansas City sits Jayhawk Nation, Lawrence, Kansas. Bustling with students and professors, Lawrence is not short of culture or things to do and see. 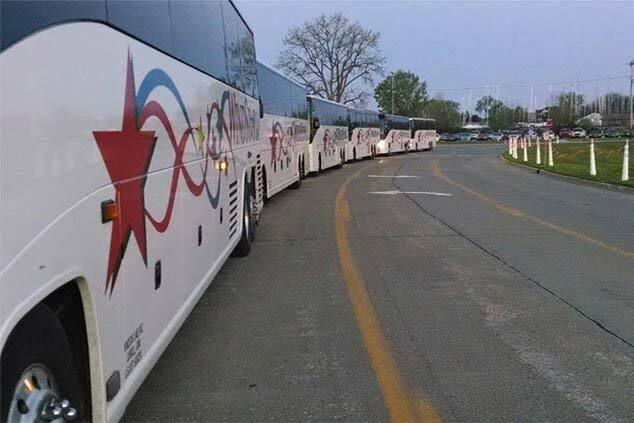 Whether the Jayhawks need team transportation or a large lecture hall of students need a school bus rental, Windstar Lines has got you covered. Plan your next trip in or out of Lawrence and experience our luxury charter bus rentals. With Lawrence being such a diverse community, it needs a motorcoach and bus rental company that has experience with all types of groups. Windstar Lines serves a multitude of groups including businesses, churches, families, and military, to name a few. No group is too large for us. With a terminal in nearby Kansas City, you will have full access to our entire fleet to choose which motorcoaches and buses are best for your trip. When you travel with Windstar Lines, you can also be sure that you will be safe. This starts with our equipment, which is all up to date, well-maintained, and meets federal safety standards. We also conduct background checks on all of our drivers and ensure they are all properly trained to operate our vehicles. We take all of the necessary measures to make sure safety is never an issue. Let Windstar Lines help you plan your next trip to or from Lawrence, Kansas. Our customer service team will help answer any questions for you and also help you plan your itinerary to ensure smooth travel. If you are ready to book your trip, want to learn more about our luxury motorcoach and bus rentals, or are just interested in a free quote, contact us today!